Katie took a road trip and camping adventure in New Zealand after her working holiday. Now she’s sharing her packing tips for camping in New Zealand with us. Sale tickets, suction hooks, and snacks. Get the most out of your cruise vacation with these cruise hacks and tips for taking a cruise. Cold weather travel can be tricky if you’re trying to pack light. Here is a list of the must-have items for traveling to colder countries and staying warm. How to pack bras depends on what kind of bras you bring, and how many. Here are our best tips for packing bras, along with options for caring for them on the road. 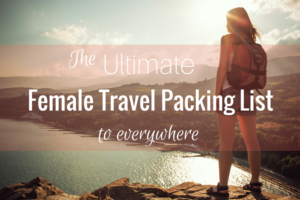 Are you an unorganized traveler who wants to pack carry-on only? Here’s hoq I travel with just carry-on luggage while not always following all the packing rules. This week’s episode of The HPL Podcast is about Gena’s experience packing one bag under 10 pounds for her trip to Costa Rica – plus her regrets and tips after doing so. With prices for baggage becoming more expensive and airlines limiting size even further, now is a good time to start traveling with only a carry on. Winter is coming, so you better pack your bags well. When you want to pack light for cold weather travel, it’s all about the layers. How do you pack light and ensure that you have clean clothes when you need them? It’s all about the outfits with quick dry fabric. Reader Question: What If I Forget to Pack Something? What if you forget to pack something for your trip? Here are some tips for dealing with this potentially stressful situation on the road. Ask HPL: Do I Pack an Umbrella or a Waterproof Jacket? Do I pack an umbrella or a waterproof rain jacket when I travel to places known for rain? And how do I do that while packing light? I don’t know about you but carry on only and Antarctica usually don’t fall in the same sentence. Ali was able to push the limits on her trip, and we chat with her in this podcast about how.